Ah yes, the curative properties of radium. 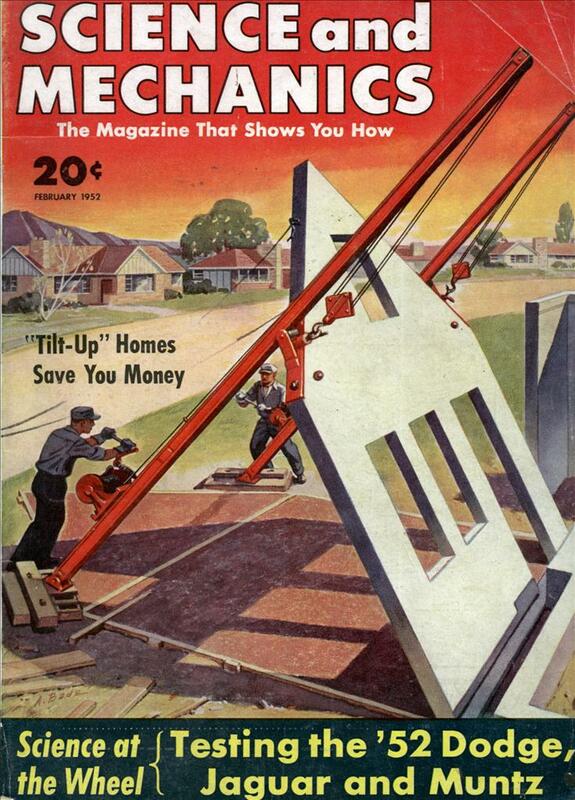 America’s third-biggest metropolis may possess a valuable radium mine. 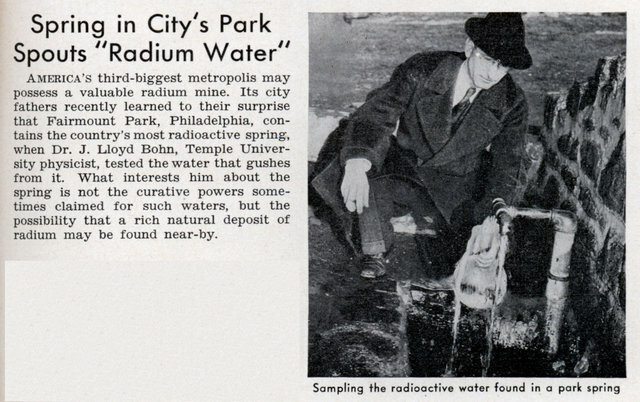 Its city fathers recently learned to their surprise that Fairmount Park, Philadelphia, contains the country’s most radioactive spring, when Dr. J. Lloyd Bohn, Temple University physicist, tested the water that gushes from it. What interests him about the spring is not the curative powers sometimes claimed for such waters, but the possibility that a rich natural deposit of radium may be found near-by. This article was written about a year after George Orwell introduced the world to Big Brother. Since closed circuit television cameras have become one of the most important and wide spread tools of “Big Brother” it seems a rather appropriate title for the article. The even mention the privacy aspect in comparison to the “much-debated wire-tapping”. YOU CAN use it for anythingâ€”absolutely anything. It will show you what’s going on around corners, through walls, underwater, in the dark, at the bottom of an oil wellâ€”or inside the human stomach. It’s TV’s little brother, a small and comparatively inexpensive wired television setup designed for industrial uses. Already three such devices are on the market. Diamond Power Specialty, a subsidiary of I.T.&T. 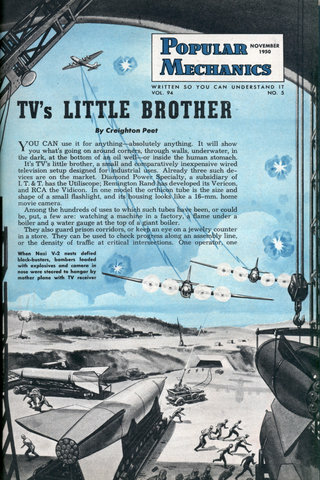 has the Utiliscope; Remington Rand has developed its Vericon, and RCA the Vidicon. 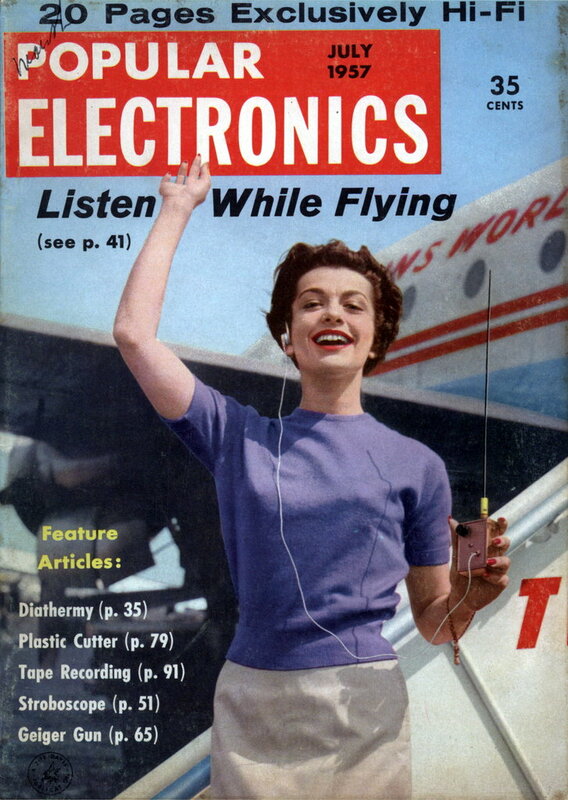 In one model the orthicon tube is the size and shape of a small flashlight, and its housing looks like a 16-mm. home movie camera. I get the feeling this poor kid’s father embarrassed him during his whole childhood. 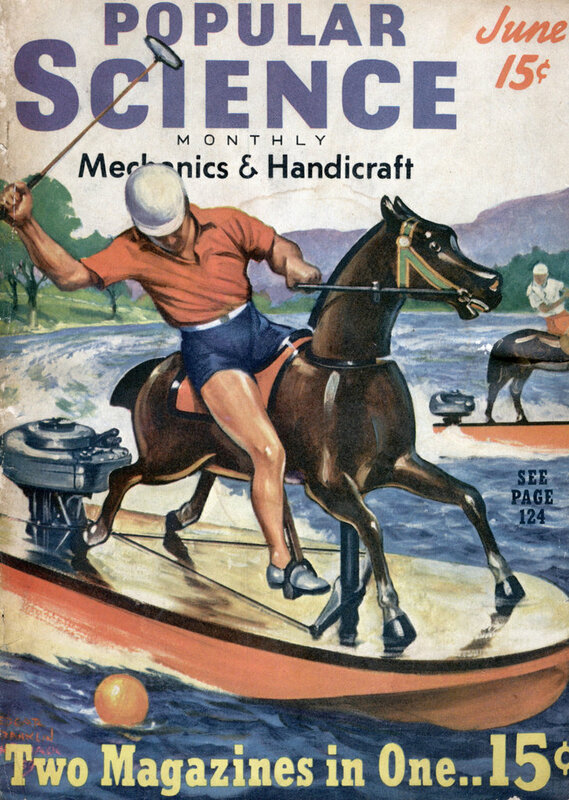 I can imagine the picture of him modeling his father’s bullet-proof lederhosen. 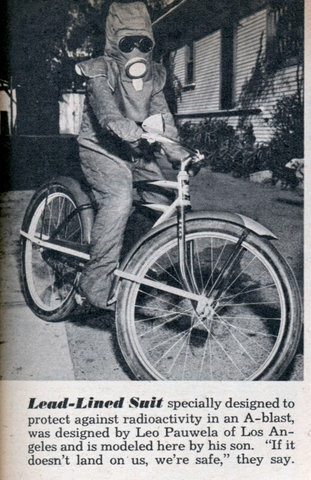 Lead-Lined Suit specially designed to protect against radioactivity in an A-blast, was designed by Leo Pauwela of Los Angeles and is modeled here by his son. “If it doesn’t land on us, we’re safe,” they say. The atomic bomb, most feared weapon the world has ever known, may prove to be the savior of millions of human lives! THE whole world knows and fears the atomic bomb. Conferences are held about it. Editorials and articles are written about it. It is implanted in the minds of most of us as a symbol for destruction and doom, a terrifying force which unloosed can mean the end of us and the world we know. Yet there is a brighter side to the picture, a side which may eventually prove the atomic bomb to be a savior of mankind rather than a destroyer. 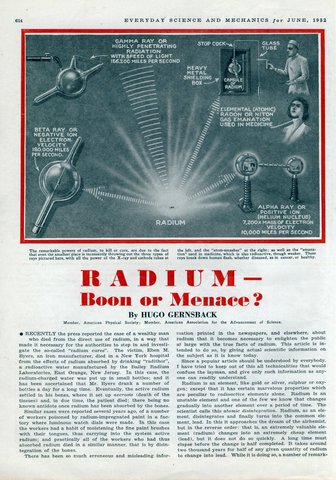 Radium – Boon or Menace? Member, American Physical Society; Member, American Association for the Advancement of Science. 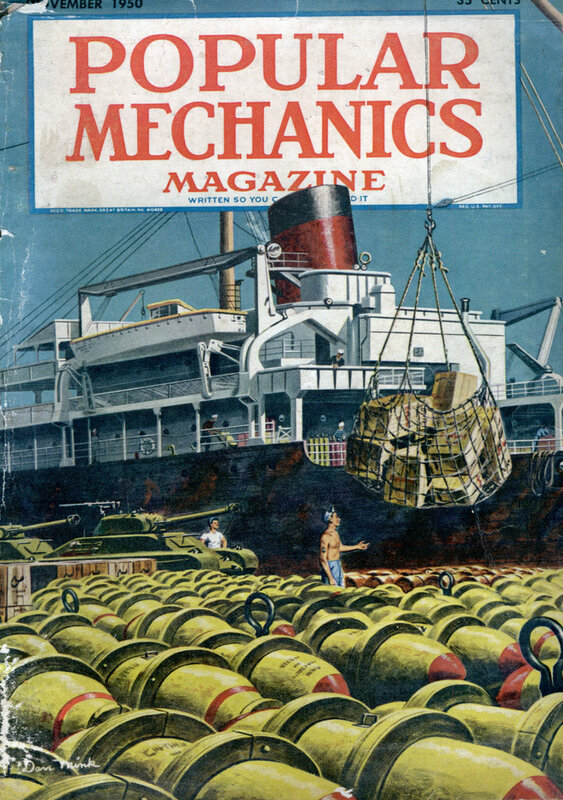 RECENTLY the press reported the case of a wealthy man who died from the direct use of radium, in a way that made it necessary for the authorities to step in and investigate the so-called “radium cures”. The victim, Eben M. Byers, an iron manufacturer, died in a New York hospital from the effects of radium absorbed by drinking “radithor”, a radioactive water manufactured by the Bailey Radium Laboratories, East Orange, New Jersey. This is a really cute hack using model trains to transport radioactive materials throughout a hospital. 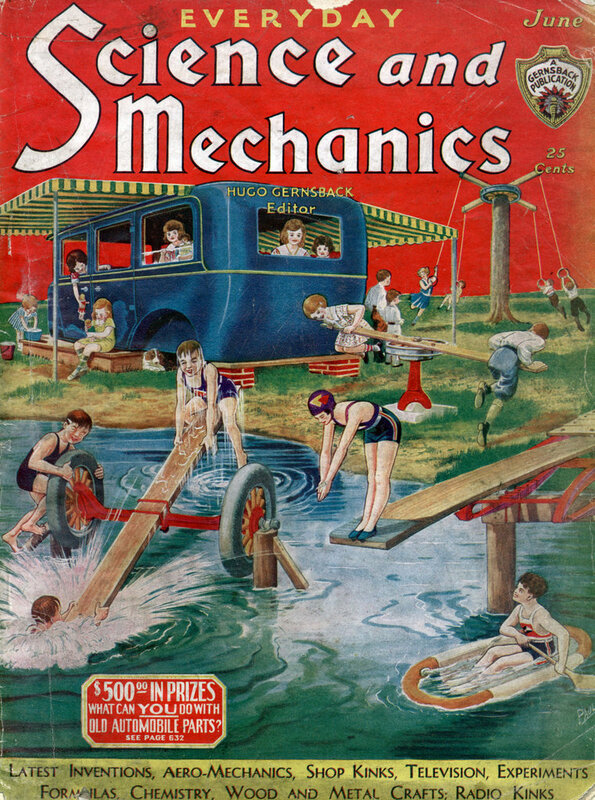 KIDS long ago became resigned to seeing Daddy play with their toy trains most of the time. Now some grown men have taken over a model railroad full timeâ€”and they are not just playing. The miniature electric train carries highly radioactive radon gas, used in cancer treatment and research, back and forth between a storage room and a laboratory, eliminating dangerous handling. The modelâ€”a standard Lionel O-gauge locomotive copied from the Pennsylvania Railroad’s GG-1â€”shuttles over a 21-ft. right of way, hauling its “hot” cargo in a lead-lined flatcar. It is the first part of a completely automatic system for transporting radon in the Cleveland Clinic. 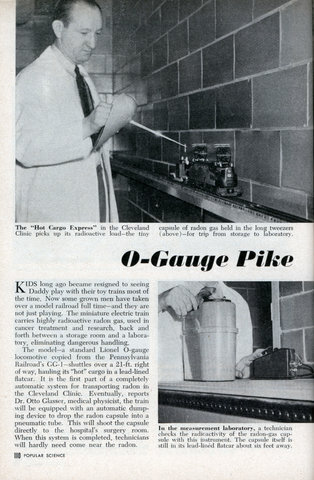 Eventually, reports Dr. Otto Glasser, medical physicist, the train will be equipped with an automatic dumping device to drop the radon capsule into a pneumatic tube. This will shoot the capsule directly to the hospital’s surgery room. When this system is completed, technicians will hardly need come near the radon. 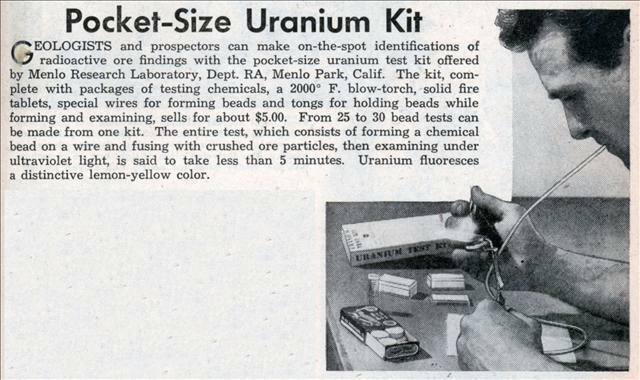 GEOLOGISTS and prospectors can make on-the-spot identifications of radioactive ore findings with the pocket-size uranium test kit offered by Menlo Research Laboratory, Dept. RA, Menlo Park, Calif. The kit, complete with packages of testing chemicals, a 2000Â° F. blow-torch, solid fire tablets, special wires for forming beads and tongs for holding beads while forming and examining, sells for about $5.00. From 25 to 30 bead tests can be made from one kit. The entire test, which consists of forming a chemical bead on a wire and fusing with crushed ore particles, then examining under ultraviolet light, is said to take less than 5 minutes. Uranium fluoresces a distinctive lemon-yellow color. 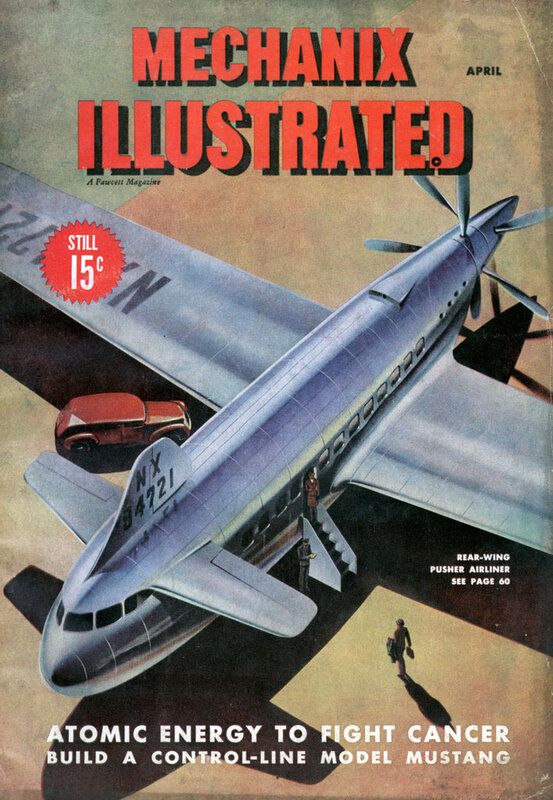 OUR long-awaited atomic-powered airplane – Convair’s Model NX2 – is finally on the drawing boards, its components in various stages of construction and testing. 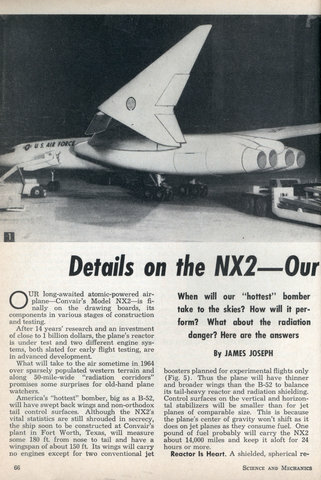 After 14 years’ research and an investment of close to 1 billion dollars, the plane’s reactor is under test and two different engine systems, both slated for early flight testing, are in advanced development. Nuclear research piles give preview of methods that may be used to make tomorrow’s electricity. Youâ€”as a citizenâ€”own a part of the 2-1/2 billion-dollar atomic-energy industry. Although your individual share is only one in 143,000,000, it is probably the most important single thing you own. It provides the most powerful weapon in our arsenal for war, promises cures for many diseases, and will eventually furnish cheaper electricity and transportation. 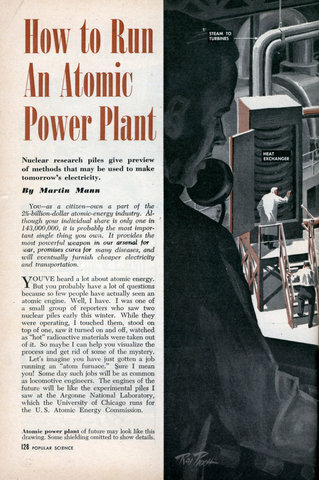 YOU’VE heard a lot about atomic energy. 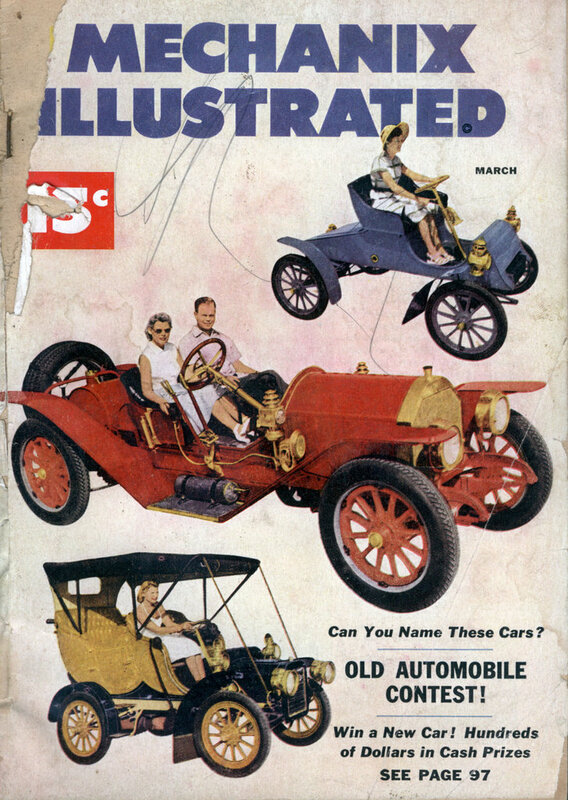 But you probably have a lot of questions because so few people have actually seen an atomic engine. Well, I have. I was one of a small group of reporters who saw two nuclear piles early this winter. While they were operating, I touched them, stood on top of one, saw it turned on and off, watched as “hot” radioactive materials were taken out of it. So maybe I can help you visualize the process and get rid of some of the mystery. 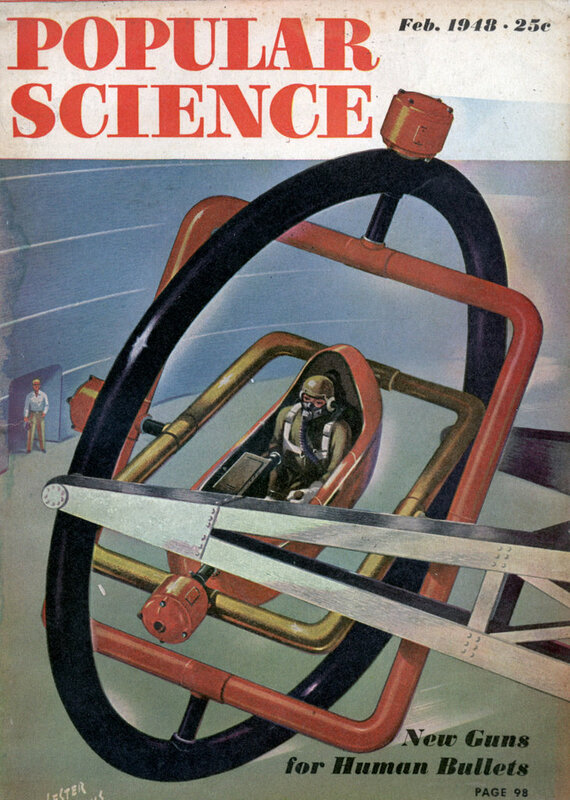 Let’s imagine you have just gotten a job running an “atom furnace.” Sure I mean you! Some day such jobs will be as common as locomotive engineers. The engines of die future will be like the experimental piles I saw at the Argonne National Laboratory, which the University of Chicago runs for the U. S. Atomic Energy Commission, used to transfer heat out of power piles, but what that material will be is still a question. That’s one reason nobody has built a real power pile yet. A good heat-transfer fluid will probably be found among the metals that melt easilyâ€”bismuth might be a possibility. 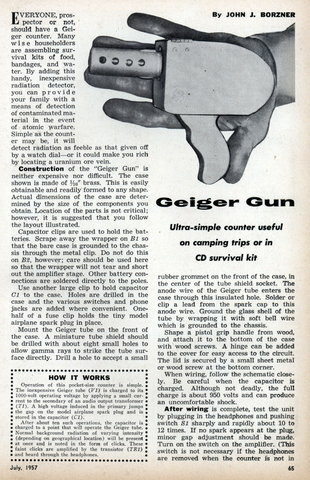 Remember, EVERYONE should have a Geiger counter! No exceptions. 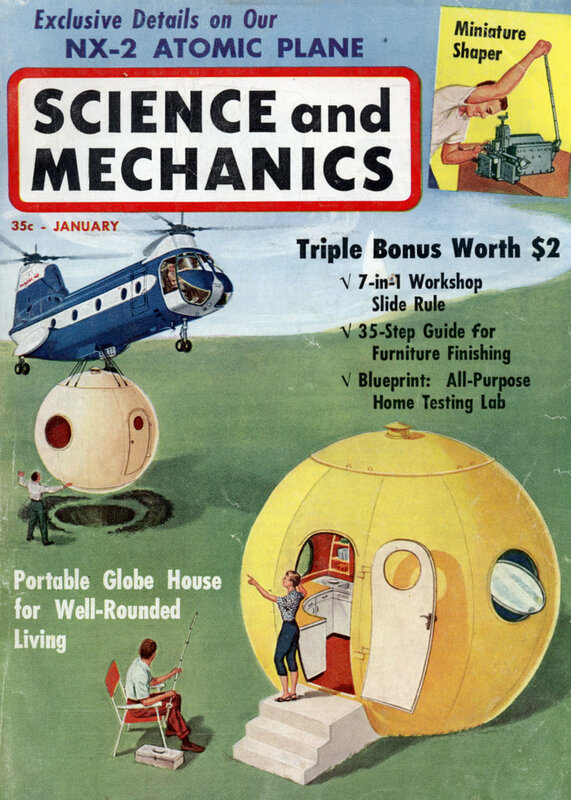 If you don’t build one now, you’re going to feel mighty stupid when you’re trying to evade the radioactive hot spots in post-apocalyptic America. EVERYONE, prospector or not, should have a Geiger counter. Many wise householders are assembling survival kits of food, bandages, and water. 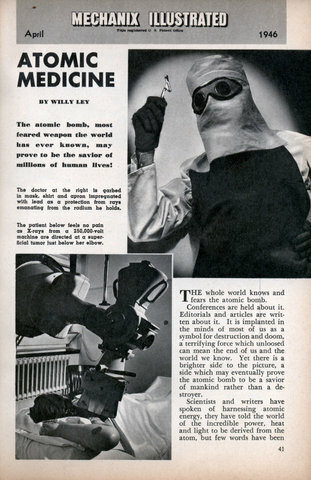 By adding this handy, inexpensive radiation detector, you can provide your family with a means of detection of contaminated material in the event of atomic warfare. 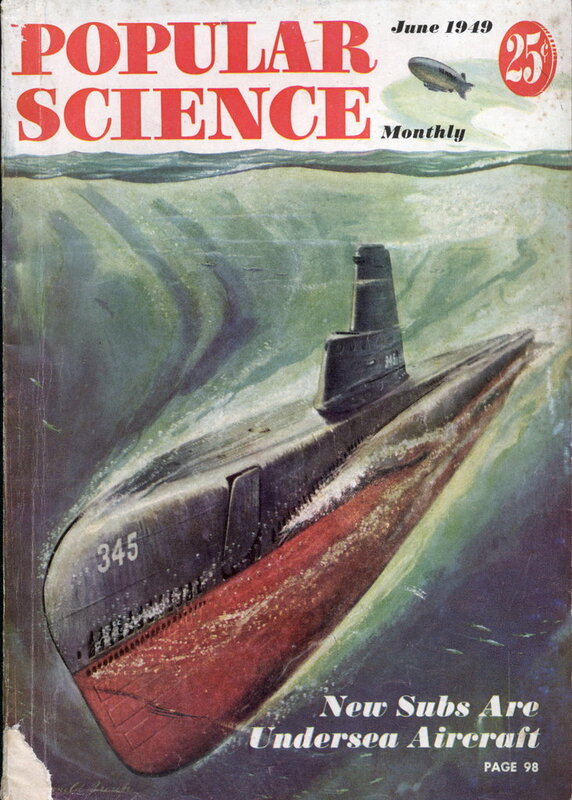 Simple as the counter may be, it will detect radiation as feeble as that given off by a watch dialâ€”or it could make you rich by locating a uranium ore vein.